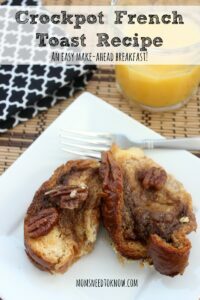 Crock Pot French Toast Recipe | Easy Breakfast Recipe! Cut the French bread into roughly ¾" thick slices. Mix together all topping ingredients in a small bowl and set aside. In another bowl beat together eggs, milk, cinnamon and sugar and set aside. Place a layer of bread into your slow cooker. Then top with a layer of topping. Repeat for remaining layers. Pour egg mixture over the bread.